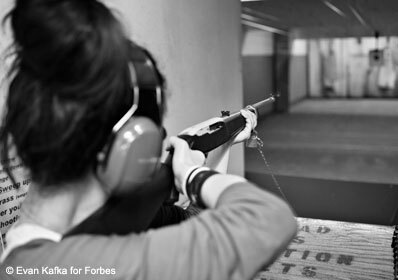 The West Side Rifle & Pistol Range–Manhattan’s only public shooting site–is in the heart of Chelsea, one of New York City’s most progressive neighborhoods. For only $65 + a background check (wtf?) you can fire a .22 rifle which is depressingly chained to the stall you’re in. Wow… they would pay for those rifles pretty damn fast. The black and white completes it. I’m imagining an infomercial here. How symbolic, just like the subjects who live in New York, who are chained to their socialist government. With high taxes from the looters, social welfare to the looters,and little to any liberty – unless you pay for it and prove you are trustworthy to exersice it. Yep, thank goodness I am in a free(er) state. I actually visited this place a few months ago. It was in connection with a “singles event” in which participants paid even more for the same experience. (Contrast that with when I paid about $50 to rip through a full magazine of a full-auto Thompson in Vegas or an MP5 in Orlando a while back…sigh). Interestingly, the rangemasters collected IDs, but seemed to have skipped the multi-day background check the night I went there. (When I inquired about going there on my own a year prior, they told me I needed to fax in my ID five days ahead of time). In addition, the Ruger 10/22 rifles we shot weren’t even chained up, but there were blocks in the rotary box magazines that limited the number of inserted rounds to five. We were also issued lower-grade lead-nosed ammo – I would gladly have paid a bit more for plated rounds. I already belong to a range in mid-Westchester County and fire both my pistols and rifles there. But the idea was to possibly meet a woman that’s interested in shooting. For better or worse, the women that went there appeared to have showed up for the experience with a gun, rather than to find a potential romantic partner. Everyone, both men and women, had a really great time. They enjoyed the whole experience and seemed interested in returning. Nice. The more people that realize guns are only as scary as the person using them the better! looks like NYC is the city to move to if you want to open up a range. 65.00 to shoot 22lr? Even if you could get past the anti-gun NYC zoning board, you’d still have all sorts of issues with abating noise, lead, fumes, etc. Not to mention absurd real estate costs, employee costs, sky-high liability insurance, etc. The $65.00 seems really crazy, but it has to offset a LOT of overhead. PS… one other film this reminds me of is the scene in which Serpico after becoming more fully aware of the dangers he may be facing from fellow cops, buys a Browning Hi-Power. “No, a division” he replies, and promptly takes it to the range. Serpico was such an awesome movie. Having been a NYC’er and escaped to a free state, I can tell you that it’s not cheap to operate a business in NYC – especially Manhattan. $65 sounds like raw profit or highway robbery but you don’t know how much rent, taxes and the dreaded liability insurance adds up to there. More power to the range that they can actually offer shooting albeit 22lr to city dwellers who cringe at the idea of a gun.